Park at the JOGS Tucson Gem Show for FREE PARKING (over 1,000 parking spots) and after you visit the JOGS Show, take the free GemRide Shuttle to many other Shows in Tucson! The shuttle is operated during late January and early February. 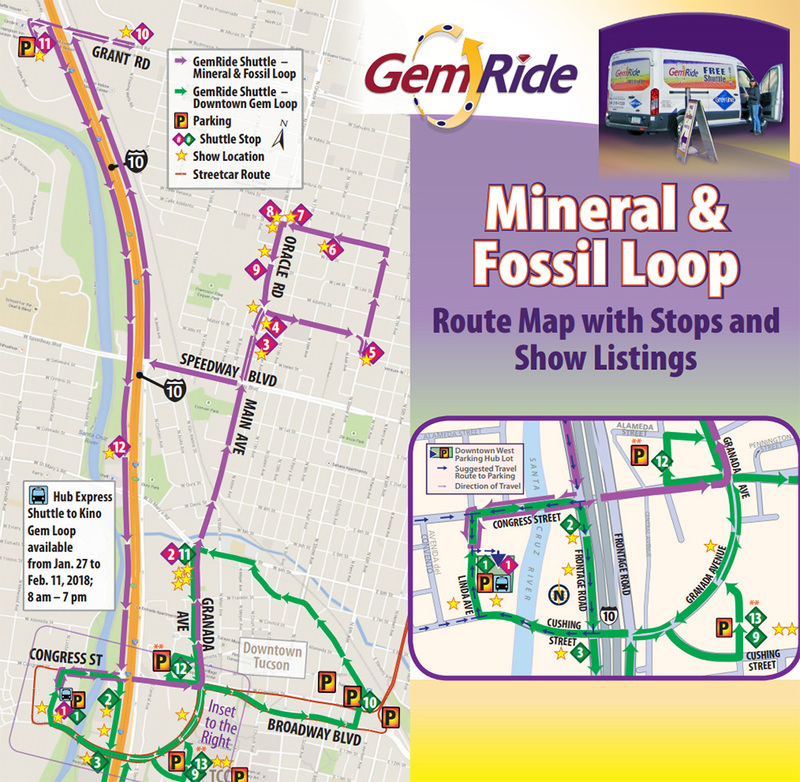 The GemRide shuttle is provided by the City of Tucson and Park Tucson during the Gem Show. Official Gem Ride Shuttle Page. You can also view the Tucson Gem Show Map if you want to see where all the shows are located. The JOGS Show and the AGTA Show have a direct shuttle running between the two shows. This limo shuttle is FREE for buyers, and is hosted by the Shows (it is not part of the GemRide shuttles). The shuttle runs for the duration of the AGTA Show, February 5 – 10, 2019 and runs during the open hours of the shows. The JCK Show Shuttle is run by the JCK Show and is not part of the official GemRide shuttles. Dropoff at the JCK Show: JW Starr Pass Marriot, 3800 W. Starr Pass Blvd. 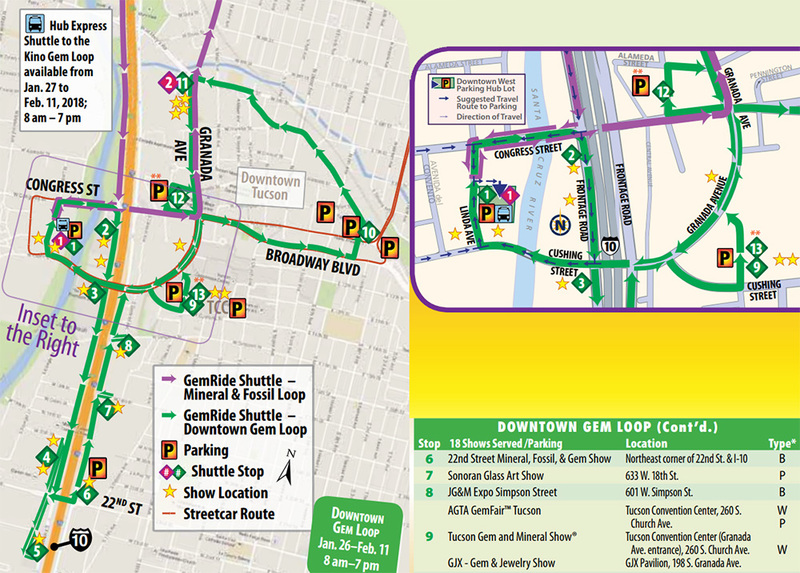 If you want to take the GemRide shuttle to get to the JCK Shuttle, the closest stop seems to be at the GJX Gem & Jewelry Show on the Downtown Gem Loop (green map) and then walk across the street to the Convention Center. 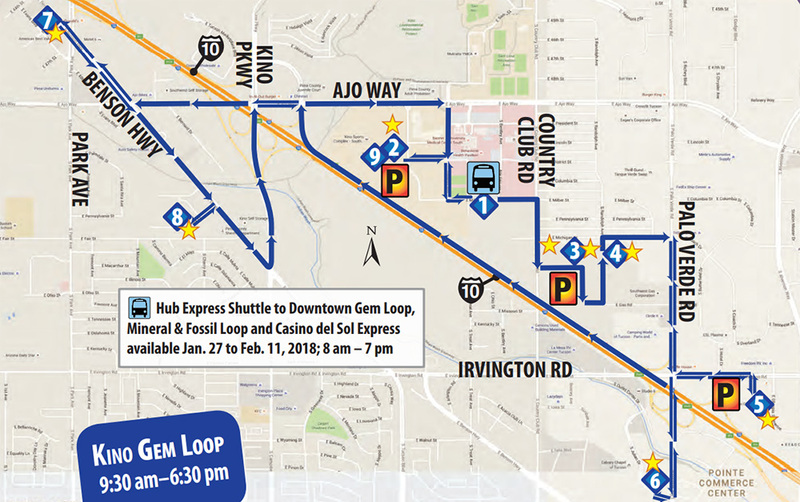 The Tucson Gem Show Shuttles will help you travel around the Tucson Gem Show without needing a car. The shuttles are FREE and anyone may ride them. 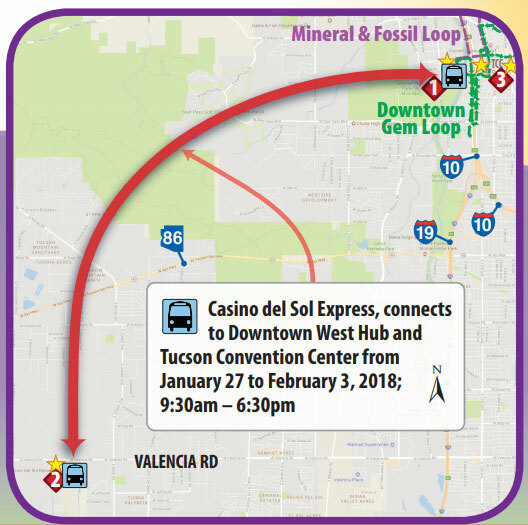 * The below schedule is from 2017, but MS Transportation says it is going to be same for 2018 (and likely 2019) (the main difference that the Turquoise Route is now has a new stop – Casino Del Sol).